This hearty black bean soup with bacon, green chile, and spices cooks in about an hour in the Instant Pot. 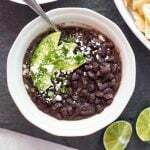 No need to soak or simmer the beans for hours – it’s so easy you can make it on a weeknight. Using the saute setting on the Instant Pot, cook the bacon for a couple of minutes or until it starts to render it’s fat. Add the onion and garlic and cook them with the bacon until they soften, about three to four minutes. Add the salt, pepper, chili powder, cumin, and oregano and stir to combine. Cook it all together just until the spices are fragrant. Add the green chili and 1/4 cup of the chicken broth. As the broth simmers scrape up the browned bits off the bottom of the pot. Add the black beans and the remaining 2 cups of chicken broth and stir. Turn off the saute setting. Place the lid on the Instant Pot and lock it into place. Close the steam vent. Choose the high-pressure setting and set the timer for 1 hour. The pot will take some time to get to pressure and once it does the timer will start. Once an hour has passed and the timer goes off, cover the steam valve with a heavy towel (to protect your hand) and open it to vent the steam (quick release method). Once all of the steam has vented, open the pot and stir the soup. Add the lime juice and chopped cilantro and stir to combine. Serve with the garnishes, if using.